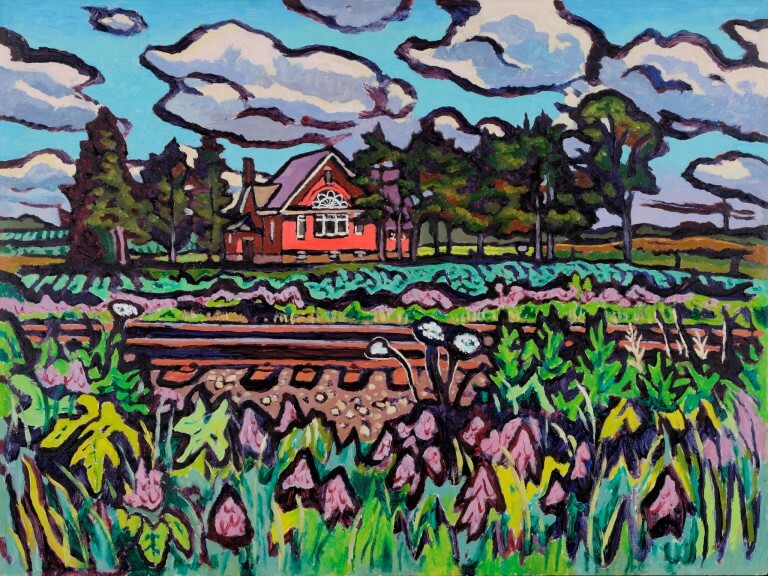 Exploring the countryside around his hometown of St. Thomas, Ontario, Clark McDougall first learned to paint from books that he borrowed from his local library. Mastering techniques explained in The History of British Watercolour Painting and Technique of Landscape Painting in Oils, he also sought advice from local artists William St. Thomas Smith and Ross Osgoode. Though he also briefly received formal instruction at the Albright-Knox School of Art in Buffalo and Toronto’s Ontario College of Art, McDougall was encouraged to keep learning on his own. He did so with enthusiasm, developing an idiosyncratic working method that scholars have only recently confirmed. McDougall would document a noteworthy scene with his camera, put the slides into a manila envelope, and label the envelope with key details such as location, date, time, weather conditions, and possibly a sketch. He would then work through his composition in smaller sketches before moving to a larger surface.1 By that time, he intimately knew his subject as well as his approach. His mature paintings are suffused with jewel-like colours and employ heavy outlines in black enamel, a technique whose bold results evoke stained glass or commercial printmaking. St. James Church reveals McDougall’s interest in using outlines and a vibrant palette to depict local scenes, but does not demonstrate the “black enamel” technique that would become his trademark. It may reflect the influence of Henri Matisse, whose handling of colour McDougall much admired.